It was a successful week for Aquis Farm trainer Steve O'Dea this week, teaming up with jockey Paul Hammersley for three runners resulting in two wins and a second placing. Kicking off the week on Wednesday at Ipswich was Proven Thoroughbreds' Anecdote by Lonhro, who won impressively by 1.3L in a Class 5 over 1350m, despite carrying the heavy weight of 58.5kg and jumping from barrier 8. 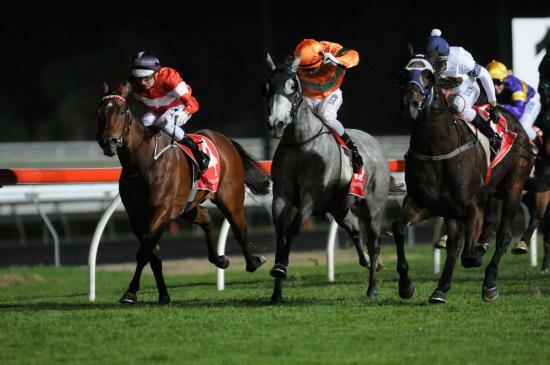 Next came The Last Kiss (pictured in the orange colours) running over 1200m at the Sunshine Coast night meeting on Friday evening. At only her fourth start, this three year old filly by Sebring out of Kiss Me Katy, also trained by O'Dea, flew home to win in a photo finish. She has now won two of her four starts. The week was rounded off for the O'Dea and Hammersley partnership with the third and final runner for the week being the younger half sister of The Last Kiss, Dream Kisses by Dream Ahead, running in Brisbane's first two year old race of the year. Jumping from barrier 9, Dream Kisses raced well to place second in her career debut. A very exciting filly indeed! With four runners at Eagle Farm today, the O'Dea stable shows no sign of slowing down anytime soon. Anecdote will most likely follow up his win this week with a run at Doomben on Saturday.